GraphicX.com – THE One Stop Source For ALL Your Graphic Design & Printing Needs! Graphic Explosions is a graphic design, printing, screen printing, and advertising company. We provide creative business and corporate identity design to give our clients complete, unified business packages. We create images from scratch or aid businesses in idea expression, determine layout/printing specifications and translate this information to production. In our continuing effort to provide our customers with an efficient and cost effective method of obtaining quality graphic design and associated products, we have combined many related products and services under one umbrella. These include graphic design, commercial printing, screen printing and embroidery, sign and banners, and promotional products. We also act as a liaison between our clients and product manufacturers. One of our fortés is our ability to interpret what our clients need and impart that information to a manufacturer in their terms. The process is also effectively reversed in order to explain complex ideas to our clients. This dramatically reduces errors in production. Well, 2018 marks our 27th year in business. What an exciting trip it's been! I'd like to take this opportunity to thank all of you, our clients, for the many years of loyalty and confidence you've shown in us. I would also like to welcome any of you who are new to Graphic Explosions. I invite you to view some testimonials from people who have worked with us for a number of years, and from some of those that have been with us from the very beginning. The reason we put such emphasis on these words is because our clients are the ones who know us best. We believe that one of the best ways for new customers to measure us is by finding out how we help other companies grow and thrive. Remember, they aren't just nameless, faceless people. They are those who really know us. Finally, if you have any questions, comments, ideas or (fingernails scraping on a blackboard) problems, please don't hesitate to contact me with specifics. I'm always here to help. I gave Ken a vague idea of what I wanted for my book cover and he was able to incorporate the colors and style I pictured in a special, unique way. He took the time to consider every element and use of the final design and ensured that the execution would be flawless. Graphic Explosions has been doing all our artwork, negatives and printing plates since 1992, and we are very happy to have found them. Ken is a great graphic designer and a good person, but most of all we never have any problem with his jobs. He really knows what he is doing. He's competent, reliable, and gives good, prompt service that we can always count on. Our school has placed a number tee shirt and sweatshirt orders with Ken. On all occasions we have been given a time frame which he has completed early! The quality has been perfect! We love doing business with him. Working with Graphic Explosions is always stress free. Whether it's meeting a deadline or when we are searching for innovative design, Graphic Explosions always meets our needs. The quality of the work is par excellence and the customer service is impeccable. Graphic Explosions helped me get my business off the ground by delevoping this killer logo, and designing all of my tee shirts and accessories graphics. They also designed and printed my business cards, hangtags and other marketing pieces. I will be continueing to count on them to create all my eye-popping graphics. I highly recommend them to anyone who is looking for outstanding quality and service. FREE, FREE, FREE! Did I get your attention? Want to be educated, entertained and amazed? 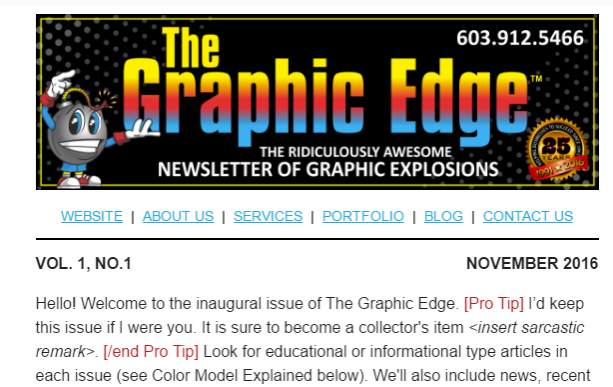 Sign up for 'The Graphic Edge,' our ridiculously awesome e-Newsletter. Use THIS LINK to sign up for the newsletter! We guarantee that we will not provide your information to any third party. So enjoy our newsletter with the guarantee of privacy. Target • TNT • Valley Works Career Center, Department of Training and Development • Vet Applied Products Co.